God’s Church has endured through the ages. It is a “little flock” (Luke 12:32), but God has always remained true to His promise that “the gates of Hades shall not prevail against it” (Matthew 16:18). In this revealing booklet, you will find a brief account of the fascinating history of the true Church of God. Jesus Christ said, “I will build My church, and the gates of Hades [the grave] shall not prevail against it” (Matthew 16:18). Which church did Jesus build, and what happened to it? When the Bible speaks of the Church, it is never speaking of a building—nor of a human organization incorporated under secular authority. The word in the Greek language that is translated “church” in English isekklesia. It is derived from two root words in Greek and literally means “called out” or “called from.” In secular usage, it referred to an assembly of citizens who were “called out” from the inhabitants of the city to consider some matter of importance. It was often used in the Greek translation of the Old Testament to refer to the congregation of Israel or to the assembly of God’s people. “Congregation” or “assembly” expresses the meaning in New Testament usage as well. However, the “called out” aspect of ekklesia is fundamental to understanding the Church. In Genesis 12, we read that Abraham was “called out” by God from Ur of the Chaldees. In Exodus 12, we read of Abraham’s descendants, the children of Israel, being “called out” by God from Egypt. They then became the congregation of Israel or the “church in the wilderness” (Acts 7:38, KJV). One of God’s final warnings to His people is a call to “come out” of Babylon (Revelation 18:4). The saints of God are not to participate in that corrupt, end-time culture’s sins, so they will not partake of the divine punishments that “Babylon” will receive. Jesus made it plain that one cannot come to Him, and be part of His Church, without being called by the Father (John 6:44). Only those who respond to the Father’s call, through repentance and baptism, will receive the Holy Spirit (Acts 2:38), and it is only through the Holy Spirit of God that we become part of the Church that Jesus built (Romans 8:9; 1 Corinthians 12:13). What happened to the Church that Jesus Christ said He would build? Did it adapt and change with the times through progressive revelation? Did it veer “off the track” and need to undergo a reformation at the hands of such men as Martin Luther and John Calvin? Or, has there been a body of believers, down through the centuries, continuing to believe and practice the same doctrines Jesus Christ and the first-century Apostles taught? When we look at the story of the mainstream, professing Christian church throughout the centuries, it appears to be a vastly different church from the one described in the pages of your New Testament. In the book of Acts we find that God’s Church celebrated “Jewish” holy days (Acts 2:1; 13:14, 42, 44; 18:21), talked about the return of Jesus Christ to judge the world (Acts 3:20–21; 17:31) and believed in the literal establishment of the Kingdom of God on earth (Acts 1:3, 6; 28:23). Yet, less than 300 years later, we find a church claiming Apostolic origin, but observing the “venerable day of the Sun” instead of the seventh-day Sabbath. When that church assembled its bishops to discuss doctrinal matters at the Council of Nicea, the meeting was presided over by a Roman Emperor—Constantine! How could such an amazing transformation have taken place? What happened? Protestant author Jesse Lyman Hurlbut acknowledged the dramatic change that took place. In his book The Story of the Christian Church, he wrote, “For fifty years after St. Paul’s life a curtain hangs over the church, through which we strive vainly to look; and when at last it rises, about 120AD with the writings of the earliest church-fathers, we find a church in many aspects very different from that in the days of St. Peter and St. Paul” (p. 41). The history of the Christian Church between Pentecost of 31AD and the Council of Nicea in 325AD, almost 300 years later, is truly amazing. It is the story of how yesterday’s orthodoxy became today’s heresy, and how old heresies came to be considered orthodox Christian doctrine. It is the story of how church tradition and the teaching of bishops came to supersede the Word of God as a source of doctrine. It is a story that is stranger than fiction, yet is historically verifiable. In Acts 8, we are introduced to a man who was used by Satan to infiltrate and subvert God’s Church. This man was Simon, the sorcerer from Samaria, better known in secular history as Simon Magus. Simon was considered by the Samaritans to be God’s divinely chosen representative (Acts 8:9–10). Eduard Lohse, writing in The New Testament Environment,states that the expression, “the great power of God,” represents Simon’s “claim to be the bearer of divine revelation” (p. 269). Simon was baptized and became a nominal Christian, along with the rest of the Samaritans. However, the Apostle Peter recognized Simon’s real motives. In Acts 8:22–23, Peter rebuked him in the strongest terms as being “in the gall of bitterness, and in the bond of iniquity” (KJV). Who were the Samaritans? The book of 2 Kings tells us that when the northern ten tribes of Israel were deported by the king of Assyria, Babylonians were settled in their place. These Babylonian Samaritans continued to practice their old Babylonian paganism, but with the added infusion of biblical terminology to obscure what they were doing (2 Kings 17:33, 41). Though they professed adherence to the God of Israel, they did not really obey God’s law (v. 34). In fact, as is made plain in the books of Ezra and Nehemiah, they became enemies of the true Work of God. The Samaritans, just as the Jews, had become dispersed throughout the known world in the aftermath of Alexander the Great’s conquests. There were Samaritan colonies in several major centers of the Roman Empire, including Alexandria, Egypt and Rome. Simon had admirers and adherents among these people. Samaritanism, with its blending of Babylonian paganism and lip-service to the God of Israel, was also heavily influenced by Greek philosophy. Simon Magus added to this an acknowledgment of Jesus Christ as the Redeemer of mankind. However, as Jesus explained, “Not everyone who says to Me, ‘Lord, Lord,’ shall enter the kingdom of heaven, but he who does the will of My Father in heaven” (Matthew 7:21). Simon used the name of Jesus, but substituted a different message—a message that did away with the need to really obey God and keep His commandments! Eerdman’s Handbook to the History of Christianity notes, “Early Christian writers regarded Simon as the fount of all heresies” (p. 100). The Encyclopaedia Britannica(11th ed.) in its article on Simon Magus identifies him as the “founder of a school of Gnostics and as a father of heresy.” Noted historian Edward Gibbon says the Gnostics “blended with the faith of Christ many sublime but obscure tenets which they derived from oriental philosophy” (The Triumph of Christendom in the Roman Empire, p. 15). Gnosticism (the term is derived from the Greek word for knowledge) was a highly intellectual way of life. It represented a blending of Babylonian mystery religion, Greek philosophical speculation and an overlay of biblical terminology. Among the Gnostics, biblical accounts were not taken literally but were treated as allegories used to teach deeper “truths.” “The Mosaic account of the creation… was treated with profound derision by the Gnostics” (Gibbon, p. 13). Gnosticism stressed pagan dualism with its emphasis on the immortality of the soul and the inherent evil of matter. It also introduced much vain speculation on the nature of God and the spirit realm. Several New Testament books—including the Gospel of John, Colossians and 1 John—were written to refute the Gnostic heresies that Simon Magus and many others began to spread. Hellenistic culture, which pervaded the Middle East and Mediterranean regions, was an alternative worldview—a competitor to the perspective and values of the Bible. It stressed the supremacy of reason and logic rather than divine revelation. The later Greeks, embarrassed by the ribald antics of their ancient gods and heroes in the writings of Homer and Hesiod, sought to explain them away as profound allegories.This approach to their “inspired” writings was picked up by Hellenistic Jews, such as Philo of Alexandria, and applied to the Bible. This treatment of the Old Testament as an allegory was a handy tool for Gnostics and others who wanted to evade obedience to plain commands. About 15 years after the baptism of Simon Magus, the Apostle Paul found it necessary to warn the Church in Thessalonica that “the mystery of lawlessness is already at work” (2 Thessalonians 2:7). About five years later, Paul warned the Corinthians that they were in danger of being corrupted by false apostles teaching “another Jesus” and “a different gospel.” Simon and his followers were, in reality, ministers of Satan masquerading as ministers of Christ (2 Corinthians 11:3–4, 13–15). By the 60s AD, the Apostle Jude, brother of James and of Jesus Christ, exhorted Christians of the necessity to “contend earnestly for the faith which was once for all delivered to the saints” (Jude 3). He went on to warn that there were certain men who had stealthily crept into the church organization, trying to turn grace into lawlessness by teaching that God’s law was no longer necessary (v. 4). By Jude’s time, the true faith had already been once and for all delivered.Modern scholars who claim that it remained for second and third century theologians to begin to formulate an accurate understanding of God’s nature would do well to reread Jude 3. It is clear that Jude does not allow for “progressive revelation”! Writing at the close of the first century, almost 30 years after the rest of the New Testament was completed, the aged Apostle John had to contend with heresies that were far more widespread than those of the days of Paul and Jude. John repeatedly emphasized the necessity of keeping God’s commandments (1 John 2:3; 3:4, 22; 5:3). In 2 John 7, he warned, “Many deceivers have gone out into the world.” In 3 John 9–10, a leader by the name of Diotrephes had gained control of some congregations in Asia Minor and was actually putting out of the Church those true Christians who remained loyal to the aged Apostle John and his teachings. An event of far-reaching implications for the New Testament Church had occurred about 25 years prior to John’s writing. This event was the destruction of Jerusalem by the Roman legions under Titus in 70AD. The Jerusalem Church of God, under the leadership of James’ successor, Simeon (first cousin of James and Christ), fled Jerusalem shortly before 70AD and went to Pella, a remote desert community. Following Simeon’s death, the Jerusalem Church of God experienced great instability, having 13 leaders in the next 28 years. Many previously promulgated heresies now emerged in full bloom. In addition, many in the Church were discouraged and confused. Events had not gone as had been generally expected. The Church was increasingly becoming a mix of new Gentile converts and second or even third generation members. During the last part of the first century and the beginning of the second, the Roman world became increasingly hostile to the Jews. Extremely oppressive laws and heavy taxes were directed against them by the Roman Empire as punishment. Between the first (66–73AD) and second (132–135AD) Jewish revolts, there were many violent anti-Jewish pogroms in places such as Alexandria and Antioch. Reacting to this, the Jews rioted in Mesopotamia, Palestine and Egypt. Frequently, Christians suffered as victims of these outbursts because they were regarded by the authorities as a Jewish sect. However, they were considered by Jewish revolutionaries to be traitors to Judaism and to Jewish political aspirations because they would not fight the Romans.During these times, hundreds of thousands of synagogue and Church members—those who worshipped on Sabbath days and studied the Scriptures—perished at Roman hands or by mobs. During this dangerous era, the Roman church under its Bishop Sixtus (ca. 116–126AD) began holding Sunday worship services and ceased observing the annual Passover, substituting Easter Sunday and “Eucharist” in its place. This is the clear record preserved by Eusebius of Caesarea, a late third- and early fourth-century scholar, who became known as the “father of church history.” Eusebius quoted his information from a letter of Irenaeus, bishop of Lyons (ca. 130–202AD) to Bishop Victor of Rome. Dr. Samuele Bacchiocchi, in his book From Sabbath to Sunday,acknowledges: “There is a wide consensus of opinion among scholars that Rome is indeed the birthplace of Easter-Sunday. Some, in fact, rightly label it as ‘Roman-Easter’” (p. 201). Of course, what is not generally realized by the speakers of non-Latin languages is that the Romans did not use the name “Easter” for their new celebration; they continued to call it by the Latin word for Passover, paschalis. This official break from the law of God was the natural outgrowth of the “mystery of iniquity,” which confused grace with lawlessness and taught that obedience to the law was unnecessary. When a practice is not deemed necessary, it is only a matter of time until convenience will dictate either its modification or its abolition. As the conflict between Judaism and the Empire heightened, many “Christians” in Rome, under the leadership of Bishop Sixtus, took steps to avoid any possibility of being considered Jews and thereby suffer persecution with them. In 135AD, at the end of the Second Jewish Revolt, the Roman Emperor Hadrian (Publius Aelius Hadrianus) took drastic steps against the Jews. He renamed Jerusalem after himself and the “god” Jupiter Capitolinus—Aelia Capitolina—and imposed the death penalty on anyone called a “Jew” who would dare enter the city. At this point Marcus, an Italian, became bishop of Jerusalem, as Gibbon records in chapter 15 of his famous Decline and Fall of the Roman Empire: “At his [Marcus’] persuasion, the most considerable part of the congregation renounced the Mosaic law, in the practice of which they had persevered above a century. By this sacrifice of their habits and prejudices they purchased free admission into the colony of Hadrian, and more firmly cemented their union with the Catholic church” (vol. 1, p. 390). What of those who continued to regard the law of God as binding for Christians? Gibbon writes: “The crimes of heresy and schism were imputed to the obscure remnant of the Nazarenes which refused to accompany their Latin bishop.… In a few years after the return of the church of Jerusalem, it became a matter of doubt and controversy whether a man who sincerely acknowledged Jesus as the Messiah, but who still continued to observe the law of Moses, could possibly hope for salvation” (p. 390). Incredible! This happened even though, just a few years earlier, they had all observed God’s Festivals together. Yet after Bishop Marcus brought in “new truth,” most professing Christians joined him in condemning those faithful Christians who held fast to the historic faith they had all been taught. Those who remained loyal to the truth were soon shunned as a source of “division” by a majority seeking to replace historic Christianity with something different. A THEOLOGY OF “NEW TRUTH”? Many of the supposedly “Christian” writings that have been preserved from the second century onward put forward a totally different theology from that of the Apostle John, who wrote just 10 or 20 years earlier. As Bacchiocchi asserts, “Ignatius, Barnabus, and Justin, whose writings constitute our major source of information for the first half of the second century, witnessed and participated in the process of separation from Judaism which led the majority of the Christians to abandon the Sabbath and adopt Sunday as the new day of worship” (p. 213). Ignatius of Antioch, in about 110AD, wrote, “It is monstrous to talk of Jesus Christ and to practice Judaism” (Magnesians, 10). He also talked of “no longer observing sabbaths.” Yet John, writing his gospel scarcely 20 years earlier, emphasized that Jesus kept the same Festivals the Jewish community kept (John 7:2; 11:55). Barnabus of Alexandria, not to be confused with the Apostle Barnabus, in his epistle written about 130AD, alleges that the Old Testament is an allegory and not intended to be understood literally. He regards the prohibitions of the law against eating unclean meats as an allegory of the type of people that Christians should avoid(Epistle of Barnabus, 10). He also seeks to allegorize the Sabbath and states, “We keep the eighth day for rejoicing in the which also Jesus rose from the dead” (Epistle of Barnabus, 15). Two prominent second century theologians, who played an important transitional role in the change from biblical theology to Roman Catholic theology, were both baptized in churches under faithful Polycarp’s leadership. Polycarp (ca. 69–155AD) had been a personal disciple of the Apostle John and was one of the few church leaders of his day to hold fast to the Truth. These two men, Justin Martyr (ca. 95–167AD) and Irenaeus (ca. 130–202AD), while maintaining some truths they had learned under Polycarp, also sought to accommodate themselves to the new direction of Roman theology in the name of “church unity.” Irenaeus, though he departed from much of Polycarp’s teaching, maintained a lifelong admiration for Polycarp as a great man of God. “Justin believed that a Jewish Christian was quite free to keep the Mosaic law without in any way compromising his Christian faith, and even that a Gentile Christian might keep Jewish customs if a Jewish Christian had influenced him to do so; only it must be held that such observances were matters of indifference and of individual conscience. But Justin had to admit that other Gentile Christians did not take so liberal a view and believed that those who observed the Mosaic law would not be saved” (The Early Church, pp. 22–23). Irenaeus grew up in Asia Minor and, when a teenager, heard Polycarp preach. He came to Rome as a young man and later became bishop of Lyons in France in 179AD. Irenaeus is considered the first great Catholic theologian and seems to have gone to great lengths to promote peace and a conciliatory spirit. His desire for peace was so great, however, that he was willing to compromise with the Truth to maintain church unity. The churches in Asia Minor under Polycarp’s leadership observed the Sabbath and the Holy Days. Yet, when Irenaeus came to Rome, he readily adapted to the Roman practices of observing Sunday and Easter. In Lyons there were some who kept Passover on Abib 14 and some who kept Easter. Irenaeus kept Easter but sought to be tolerant of those who still observed Passover. A theological revolution was indeed taking place in the Church of the second century. Notice: “Justin Martyr occupies a central position in the history of Christian thought of the second century.… Justin also molded the thinking of Irenaeus, bishop of Lyons” (Chadwick, p. 79). Though Justin became a professing Christian in Ephesus, he “did not understand this to mean the abandonment of his philosophical inquiries, nor even the renunciation of all that he had learnt from Platonism” (p. 75). He believed that the God of Plato was also the God of the Bible. “Justin does not make rigid and exclusive claims for divine revelation to the Hebrews so as to invalidate the value of other sources of wisdom. Abraham and Socrates are alike Christians before Christ” (p. 76). This approach set the stage for a reshaping of Christian theology to embrace much of Greek philosophical thought concerning the nature of God. In spite of all this, Justin acknowledged the authority of the book of Revelation and believed “Christ would return to a rebuilt Jerusalem to reign with his saints for a thousand years” (p. 78). Irenaeus, heavily influenced by Justin, also preserved bits and pieces of the Truth in spite of conforming to Roman practices. He rightly taught: “The purpose of our existence is the making of character by the mastery of difficulties and temptations” (p. 81). He also adhered to the literal hope of an earthly millennium,during which Christ would reign on earth, and taught against interpreting the millennial hope as symbolic of heaven, though he toned down his insistence on this point in his later works. There were two fundamental errors that separated professing Christians from those who truly represented the continuation of the Church that Jesus built. These errors involved whether or not God’s law was still obligatory for Christians, and who and what God is. Errors on these two points led to an ever-widening divergence between the professing Christian church and the true Church of God. The importance of the law was the major area of controversy from about 50AD until 200AD. It was not finally resolved until the Councils of Nicea (325AD) and Laodicea (363AD) when the Roman state became involved. The substance of the conflict is preserved in the confrontation between Polycrates of Asia Minor and Victor, bishop of Rome, about 190AD.Polycrates was the successor of Polycarp who was himself a disciple of the Apostle John. Irenaeus records that Polycarp had traveled to Rome in the mid-second century to try and persuade Anicetus, bishop of Rome, of the true time of the Passover. Anicetus claimed to have been bound by the tradition of his predecessors since Bishop Sixtus, while Polycarp declared, “He had always observed it [Passover] with John the disciple of our Lord, and the rest of the apostles, with whom he associated” (Eusebius, xxiv). “We therefore observe the genuine day [Passover]; neither adding thereto nor taking therefrom. For in Asia great lights have fallen asleep, which shall rise again in the day of the Lord’s appearing, in which he will come with glory from heaven, and will raise up all the saints; Philip, one of the twelve apostles, who sleeps in Hierapolis… John, who rested upon the bosom of our Lord… Polycarp of Smyrna.… All these observed the fourteenth day of the Passover according to the gospeldeviating in no respect, but following the rule of faith…and my relatives always observed the day when the people threw away the leaven [Abib 14]. I, therefore, brethren, am now 65 years in the Lord, who having conferred with the brethren throughout the world, and having studied the whole of the sacred Scriptures, am not at all alarmed at those things with which I am threatened, to intimidate me. For they who are greater than I, have said, ‘We ought to obey God rather than men’” (Eusebius, xxiv). In the first century, Paul had praised the Bereans for their approach in “checking up on him” by searching the Scriptures daily to see if he was teaching truth (Acts 17:11). He exhorted the Thessalonians to “prove all things; hold fast that which is good” (1 Thessalonians 5:21, KJV). Constantly, throughout the first century, we see an appeal being made to the Scriptures. About ten years later Ignatius stressed the same point, “Unity and peace in the church and the validity of the church are acquired through faithful adherence to the bishop” (Masterpieces). By the middle of the next century, the claims had grown so forcefully that Cyprian of North Africa stated: “The focus of unity is the bishop. To forsake him is to forsake the Church, and he cannot have God for his Father who has not the Church for his mother” (Chadwick, p. 119). These claims were being made to hold brethren in an organization that was rapidly developing into what we know today as the Roman Catholic Church. How different these appeals are to those of Paul and the other New Testament leaders who pointed to the Scriptures and to the fruits of their ministries for authentication (cf. 1 Corinthians 11:1; Acts 17:2).No longer able to rely on a clear appeal to Scripture, second- and third-century church leaders increasingly based their claim to the loyalty of the brethren upon their assertion of being duly ordained successors of the Apostles and the bishops who succeeded them. While they increasingly abandoned what the Apostles taught, these deceivers sought to hold brethren together by appeals to unity and to the memory of the Apostles. At the time of the Apostle John’s death near the dawn of the second century AD, the Christian movement, though obviously beset by many problems and false teachers, bore at least a recognizable resemblance to the Church of God of the book of Acts. But, by the beginning of the third century AD, most of those same congregations, though still calling themselves “Church of God,” bore far more resemblance in doctrine to the medieval Catholic Church than to the Church of God during the days of the Apostles Peter, James, Paul and John.How did so many move so far so quickly? This is the question that simply leaps out at us as we examine the history of the early Church. During the second century, a number of gradual shifts occurred in both the doctrine and practice of the vast majority of church congregations. The stage was set for those shifts by some of the very ideas that began to be promulgated only a few years after Christ’s resurrection and ascension into heaven. Ideas always produce consequences! Christ spent His ministry preaching the “Good News” of a coming divine government that would replace the oppressive human governments Jesus’ listeners knew all too well. The disciples asked Him for signs showing when that time would be near (Matthew 24:3). The last question they asked, as He was preparing to ascend into heaven, concerned whether it was yet time for the Kingdom to be established (Acts 1:6). In the last stage of Paul’s ministry of which we have any record, we find that Paul was still “preaching the kingdom of God and teaching the things which concern the Lord Jesus Christ with all confidence, no one forbidding him” (Acts 28:31)! Even in the last inspired book of the New Testament canon, Jesus Christ inspired the Apostle John with visions about the literal establishment of the Kingdom of God on this earth (Revelation 19:11–21; 20:4–6; 21). In spite of this clear record of Jesus Christ’s plain teaching, we read in 2 Corinthians 11:3–15 that false ministers had crept into the Church, and within 25 years after its founding were preaching what Paul called “another gospel.” By the second century, the true Gospel that Jesus had taught was being called a “doubtful opinion” by the leaders of the budding “orthodox” Christian church. By the third century, Christ’s own example and teaching was being regarded as rank heresy. During the second and third centuries, the “gospel” that was being preached focused almost exclusively on the person of Jesus. Also, at that same time, pagan concepts about the immortality of the soul, as well as heaven and hell, gained acceptance. “The assurance of such a Millennium was carefully inculcated by… [those] who conversed with the immediate disciples of the apostles.… But when the edifice of the church was almost completed, the temporary support was laid aside. The doctrine of Christ’s reign upon earth was at first treated as a profound allegory, was considered by degrees as a doubtful and useless opinion, and was at length rejected as the absurd invention of heresy and fanaticism” (Decline and Fall of the Roman Empire, vol. 1, ch. 15). Much of this progression was the result of Origen’s influence. Origen was, as we shall shortly see, one of the least sound-minded individuals ever to be accepted as a Christian theologian. He played a major role in formulating Catholic teaching on the Trinity, the immortality of the soul and the Kingdom of God. As the foundational understanding of the true nature of the Gospel and the Kingdom of God was abandoned, there were many disastrous consequences. One was the participation of church members in politics and in the military. Historians are virtually unanimous in acknowledging that early Christians avoided such involvement, “But, while they inculcated the maxims of passive obedience, they refused to take any active part in the civil administration or the military defense of the empire” (Gibbon, The Triumph of Christendom in the Roman Empire, p. 41). By the end of the third century, however, there were “Christian” legions in the Roman army. Professing Christians were told that political involvement was acceptable. “In the KJV of the OT [the clue is partly obliterated in modern translations] ‘soul’ represents almost exclusively the Hebrewnephesh. The word ‘soul’ in English… frequently carries with it overtones, ultimately coming from philosophical Greek (Platonism) and from Orphism and Gnosticism, which are absent in nephesh. In the OT it never means the immortal soul, but is essentially the life principle, or the living being.… Psuche in the NT corresponds tonephesh in the OT” (vol. 4, p. 428). How did the concept of an immortal soul enter into Christianity? As early as 200BC, some Jewish sects were beginning to absorb this idea, due to Greek influence, and were attempting to meld it with the biblical teaching of the resurrection. This is illustrated by such intertestamental apocryphal writings as the Book of Jubilees and Fourth Maccabees, as well as by both Philo and Josephus. The Gnostics, with their emphasis on pagan dualism, stressed the immortality of the soul in contrast to the resurrection of the body. The International Standard Bible Encyclopediastates, “There is a distinction between a Platonic belief in the immortality of the soul alone and biblical teaching regarding the resurrection of the dead” (vol. 2, p. 810). There was not simply one heresy regarding the nature of God, but many different contradictory ones. There seem to have been almost as many different ideas as there were philosophical schools and teachers. Mainstream Catholic thought, from which orthodox Protestant teaching on the subject sprang, merely represents the particular brand of heresy that won out over its competitors. Since it is this teaching that has survived, with some modification, until our time, it is the one that we will examine most closely. Origen appropriated the philosophy of middle-Platonism more systematically than the apologists and Tertullian had. In fact, his ‘concept of eternal generation’ was an adaptation of the middle-Platonic doctrine that the whole world of spiritual beings was eternal. The Son is eternally derived (or generated) from the very being of God and hence is of the Father’s essence, but second to the Father.… Origen, like Tertullian coined a generic term for the ‘three’ of the divine triad. The Father, the Son, and Holy Spirit are ‘three hypostases’.… Origen’s major contribution to the formulation of the trinitarian doctrine is the notion of eternal generation. His generic term for the ‘three’ (hypostases) will be adopted and refined in the fourth century” (p. 1054). As we look at the development of “Christian” theology in the late second and early third centuries, the names of Tertullian and Origen keep coming up. Tertullian (ca. 150–225AD), called the father of Latin theology, was “one of the most powerful writers of the time and almost as influential as Augustine in the development of theology in the West” (Eerdman, Handbook to the History of Christianity, p. 77). Origen (ca. 185–254AD) “was the greatest scholar and most prolific author of the early church” (Eerdman, p. 104). About 203AD, Origen succeeded Clement of Alexandria as leader of a famous school that purported to prepare Christians for baptism and offered courses in philosophy and natural science for the general populace. For all his reputation as a great scholar and teacher of theology, how much did Origen really understand? According to the fourth-century church historian Eusebius, not too long after he took over the school at Alexandria, Origen castrated himself! This act was based upon his understanding (or rather, misunderstanding!) of Christ’s words inMatthew 5:29–30. This same utter lack of sound-minded understanding of the real meaning and intent of Scripture is poignantly displayed in much of his theological writing. “Origen introduced the possibility of a remedial hell [purgatory]” (International Bible Encyclopedia, “Hell”). He also played an important part in what later developed into Catholic Mary-worship by first proposing the idea that Mary remained a virgin after the birth of Jesus. “Both Tertullian and Clement of Alexandria regarded this prohibition as absolute and binding on Christians. Images and cultic statues belonged to the demonic world of paganism. In fact, the only second-century Christians known to have had images of Christ were radical Gnostics.… Yet before the end of the second century Christians were freely expressing their faith in artistic terms” (Henry Chadwick, The Pelican History of the Church, p. 277). “About 327 [AD] the learned historian Eusebius of Caesarea received a letter from the emperor’s sister Constantia asking him for a picture of Christ.… Eusebius wrote her a very stern reply. He was well aware that one could find pictures of Christ and of the apostles. They were for sale in the bazaars of Palestine, and he had himself seen them. But Eusebius did not think the painters and shopkeepers selling these mementos to pilgrims were Christians at all… [he] takes it for granted that only pagan artists would dream of making such representations” (ibid., pp. 280–281). Epiphanius of Salamis, a fourth-century church leader, was horrified to find in a church-porch in Palestine a curtain with a purported picture of Christ. He not only lodged a vehement protest with the bishop of Jerusalem, but personally tore down the curtain and destroyed it. By the time of his death in 403AD, however, portrayals of Christ and the saints were becoming increasingly widespread. This was accompanied by theveneration of Mary which, by 400AD, was occupying an ever-increasing place in private devotions. After almost three centuries of on-again, off-again persecution by the Roman government, the Edict of Toleration was issued at Milan in 313AD. Soon afterward, Christianity went from simply being officially tolerated by the Roman Empire to actually becoming the official state religion of the empire. Did this represent a success story for the Church that Jesus Christ built? Had true, biblical Christianity triumphed in the Roman Empire? Far from it! What we have seen is a Gentile-influenced religion that appropriated Christian terminology while retaining pagan traditions—all enforced by the Roman emperor, Constantine. It was vastly different from the persecuted, Judeo-Christian Church established by Jesus Christ Himself in the first century. Constantine recognized the important role that religion could play in uniting his empire and giving his populace a common identity. Motivated primarily by these political concerns, Constantine forged an alliance with the bishop of Rome and began the process of creating a “standard brand” of “Christianity” throughout his empire. He was instrumental in calling the Council of Nicea in 325AD and actually presided over it himself. Keep in mind that Constantine was not even baptized yet! In fact he put off baptism until he was on his deathbed, at which point he was too ill to be immersed. His personal example of being sprinkled contributed much to an abandonment of immersion in favor of sprinkling. The Council of Nicea primarily sought to resolve two thorny issues that had not been fully settled earlier. These involved controversies about thenature of God as well as the Easter/Passover question. Backed up by imperial muscle, the views of the Roman church prevailed at the council. All opposition was squelched. Constantine was also responsible for making “the venerable day of the Sun” a state holiday when the courts were to be closed and most businesses were to shut their doors. This Roman emperor had previously been a devotee of Sol Invictus (“the Unconquered Sun”) and with his “conversion,” many motifs of sun worship, such as the use of the cross and the halo in art, entered “Christianity.” Also at this time, there began to be mass conversions of the populace. To facilitate this, popular holidays such as Saturnalia and Lupercalia were recycled into new “Christian” observances, now called Christmas and St. Valentine’s Day. The leaders of the church at Rome claimed that they were merely broadening the way, making Christianity more accessible to the masses and certainly much less “Jewish.” Anti-Semitism was a motivating force in Roman Christianity. WHERE WAS THE CHURCH JESUS CHRIST BUILT? What had happened to the Church that was established through an outpouring of God’s Holy Spirit on the day of Pentecost in 31AD? Where was Christ and what was He doing during this time? In the second and third chapters of the book of Revelation, we find messages that Jesus Christ recorded for the seven churches of Asia Minor. In the first chapter, the Apostle John saw a vision of the glorified Christ standing in the midst of seven golden lampstands. These seven lampstands represent the Church of God in its entirety throughout time (Revelation 1:12–20). The seven cities of Asia Minor mentioned in Revelation were physically situated as successive stops on a Roman mail route. What is the significance of these seven messages? Clearly, these message have a historical application to seven literal congregations in the first century. Additionally, however—and important for us today—these congregations exemplify attitudes and problems that might characterize the Christian community, as well as individual Christians, in the years since John wrote (cf. Revelation 2:7). When we look at the context of the book of Revelation, we must recognize that it is primarily intended as a prophecy. Revelation 1:1shows that the book’s purpose is to show to God’s servants things that would soon begin to happen. Thus the seven churches should primarily be understood as representing the entire history of God’s Church in seven successive church eras. The first church to be addressed in Revelation 2 is the Church at Ephesus. This church characterized the Apostolic era. In verse 2, we read that the great test of that first era lay in determining who were the true Apostles of Christ and who were liars (cf. 2 Corinthians 11:3–15). This was an era that labored long and hard to do the Work of God and endured much difficulty and persecution in the process. The true Christians of the Ephesian era were those who rejected and hated the practices of the Nicolaitans (followers of Simon Magus). However, after the destruction of the Temple in Jerusalem in 70AD, discouragement and spiritual lethargy set in. The brethren had expected Christ to return shortly after Roman armies had surrounded Jerusalem. But now most of Judea and Galilee lay in ruins, occupied by Roman legions. The Jewish Christians were considered traitors by their fellow countrymen, and probable troublemakers by the Roman authorities. Life was hard and dangerous. This era had left its first love, that early zeal for doing the Work. The membership began losing focus regarding those doctrines, practices and priorities that gave them their true identity and purpose. The living Christ’s message to Christians of the Ephesian era was that if the Ephesians did not repent and return to their first works of zealous proclamation of the Gospel, He would remove their lampstand. The apostasy of the overwhelming majority of the Jerusalem Church in 135AD(when the Second Jewish Revolt against Rome was totally crushed) is generally taken to mark the ending of the Ephesian era. Those who remained faithful during these trying final days were labeled as “Nazarenes” (cf. Acts 24:5) and “Ebionites” (poor ones) by the larger church. As is also the case today, a wide variety of “independent” groups, mixing truth and error in a wide assortment of ideas, existed alongside the true Church of God. These groups were sometimes lumped in as fellow “heretics” with the “Nazarenes” or “Ebionites” by the Roman church. In the closing decades of the second century, Polycrates, a faithful church leader who had been personally trained by Polycarp, arose. He remained the only Christian leader of prominence who was faithful to the example of the Apostles of the Jerusalem Church of God. Polycrates taught the true Gospel of the literal establishment of the Kingdom of God on earth, the unconscious state of the dead awaiting the resurrection, the importance of keeping God’s law and the observance of the biblical Festivals. Toward the end of the second century, Victor, bishop of Rome, had begun labeling Polycrates and those who followed his teachings as heretics—sources of discord and schism in the church. Polycrates remained faithful despite increasing pressure and isolation from supposed “fellow Christians,” as well as persecution and hostility from the surrounding pagan society. After his death, however, we know of no other strong, prominent leader among those faithful churches in Asia Minor. In the public’s perception, true Christians lost ground to the much more popular and accommodating Roman church. Their numbers shrank and they became increasingly isolated. Despised and labeled “Ebionites” by the mainstream church, individuals and groups of families who remained faithful had to relocate into more remote areas of Asia Minor. Even as early as the end of the first century, there were true Christians being put out of congregations headed by apostate leaders (3 John 9–10). By the second century, others, such as the faithful remnant who refused to accept “new truth” from Bishop Marcus of Jerusalem, were being forced to withdraw themselves from congregations of which they had been members. This occurred as unfaithful leaders led the visible church further and further astray. The great test of the Smyrna era lay in two areas. One was their ability to distinguish between the continuation of the true Church of God and what was, in reality, the emerging Synagogue of Satan. The other lay in their willingness to endure persecution and even death in order to remain faithful to God (Revelation 2:9–10). Physically, the Christians of this era were impoverished and persecuted. They were rejected as heretics by the rapidly growing “Orthodox” movement, labeled as apostates from the synagogue by the Jews, and looked upon with contempt and suspicion by the surrounding pagan Roman society. In God’s estimation, however, those who remained faithful during this horrible time were accounted as having spiritual wealth of great value, and will ultimately receive a crown of life (Revelation 2:9–10). After Constantine began the systematic enforcement of compliance with Roman theology in 325AD, the remnants of the true Church were in large part forced to flee the bounds of the Roman Empire into the mountains of Armenia, and later into the Balkan areas of Europe. They were few in number, utterly lacking in prestige or wealth and labeled as enemies of the state by a supposedly “Christian” Roman Empire. In God’s sight, however, they were precious. It was not God’s purpose that His true Church grow into a great, powerful organization that would “Christianize” the world. His true Church was to remain a “little flock” (Luke 12:32). Its continuity would be measured, not by a succession of proud, powerful, presiding bishops in a particular city (cf. Hebrews 13:14), but by a succession of faithful, converted people who, though scattered and persecuted, continued to worship the Father in spirit and in truth (John 4:23–24). There would be times when God would raise up faithful leaders to revitalize His people and do some sort of Work that had public visibility, at least in localized areas. There were other times when God’s Church continued to exist in such scattered obscurity that it was visible only to God. Still, it never died out. In the aftermath of the Council of Nicea, Emperor Constantine and his successors sought to stamp out all non-conforming brands of Christianity. Groups that refused to conform to the teachings and practices of the “established” church, which now called itself the Catholic (universal) Church of God, were viewed not merely as heretics, but as subversive enemies of the Roman state. The true Church, symbolized by a woman in Revelation 12, was forced to flee into the wilderness for 1,260 “days.” In Bible prophecy, a “day” often represents a year (Numbers 14:34; Ezekiel 4:6). Thus, the true Church would have to remain in hiding for 1,260 years following the Nicene Council. Historically, that is what happened. Though these were truly dark ages, there was a light that continued to burn. Its flame sometimes flickered, but it was never extinguished. Several problems confront any church scholar or historian who wishes to trace the wanderings of the true Church during this 1,260-year period. This is because the true Church’s history is not about one continuous human organization. The preserved history of the Sabbath-keeping Church of God has been almost entirely written by its enemies who viewed it as heretical. We read of groups labeled by hostile outsiders with such names as Paulicians, Bogomils and Waldenses—of whom smaller or larger segments, at different times, appear to have been true Christians in the mold of the first-century Jerusalem Church. Another difficulty is that the teachings of each of these groups changed over a period of time, generally becoming more like those of their Catholic and Protestant neighbors. Also we find that writers often lumped together various groups of “heretics,” including the true Church, under the same name, not truly distinguishing the differences in their teachings. Thus the great challenge in Church history is not simply to identify who taught what, but to recognize when a church ceased to be part of the true Church, and when God removed that true Church to another place. During the first three centuries of its existence, the Church of God faced intermittent periods of harsh persecution. However, during those times, they were not singled out, but were generally lumped in with the Jews and a wide range of Christ-professing sects. Those persecutions were of limited duration and local in scope. The Roman Emperor Diocletian, from 303 to 313AD, unleashed the worst of these pre-Council of Nicea persecutions. These are the “ten days” referred to in Revelation 2:10. When Constantine consolidated his power in the Empire, things changed significantly. Gibbon tells us that Constantine’s religious devotion was “peculiarly directed toward the genius of the Sun… and he was pleased to be represented with the symbols of the God of Light and Poetry. The unerring shafts of that deity, the brightness of his eyes… seem to point him out as the patron of a young hero. The altars of Apollo were crowned with the votive offerings of Constantine; and the credulous multitude were taught to believe that the emperor was permitted to behold with mortal eyes the visible majesty of their tutelar deity.… The Sun was universally celebrated as the invincible guide and protector of Constantine” (The Triumph of Christendom, p. 309). Four years prior to the Council of Nicea, Constantine proclaimed a law for the Roman Empire that was to have far-reaching implications for God’s people. “The earliest recognition of the observance of Sunday as a legal duty is a constitution of Constantine in 321AD, enacting that all courts of justice, inhabitants of towns, and workshops were to be at rest on Sunday (venerabili die solis, i.e., venerable day of the Sun).… This was the first of a long series of imperial constitutions, most of which are incorporated in the Code of Justinian.” About forty years later, the Catholic Church followed up on this imperial edict in “canon  of the Council of Laodicea [363AD], which forbids Christians from Judaizing and resting on the Sabbath day, and actually enjoins them to work on that day” (Encyclopaedia Britannica, 11th ed., “Sunday”). The very fact that, in the latter fourth century, the Roman Church felt the need to legislate against Sabbath observance shows that faithful remnants, particularly in Asia Minor, persevered in the Truth. This increasingly powerful church insisted that all must now accept the “Christianized” brand of Roman Sun worship. Those who refused were easily identified and could no longer function if they remained in the urban areas of the Roman Empire. Consequently, in the fourth century, those Christians labeled as Nazarenes disappeared from the populous areas of Asia Minor. For three centuries the remnants of the true Church had sojourned there, but with the enactment of this Sunday law by Constantine, they were forced to flee. The fourth-century Catholic historian Epiphanius describes these people who differed “from the Jews and [Catholic] Christians: with the Jews they do not agree because of their belief in Christ, with [Catholic] Christians because they are trained in the Law.… This heresy of the Nazarenes exists in Beroea in the neighborhood of Coele Syria and the Decapolis in the region of Pella.… From there it took its beginning after the exodus from Jerusalem when all the disciples went to live in Pella” (Ray Pritz, Nazarene Jewish Christianity, p. 34). In the fifth century, the Church appeared in remote areas of eastern Asia Minor near the Euphrates River and in the mountains of Armenia. These people were labeled by their contemporaries as “Paulicians.” Who were they? According to Armenian scholar Nina Garsoian in The Paulician Heresy, “It would, then, appear that the Paulicians are to be taken as the survival of the earlier form of Christianity in Armenia” (p. 227). The author also states that the Paulicians were “accused of being worse than other sects because of adding Judaism” (p. 213). 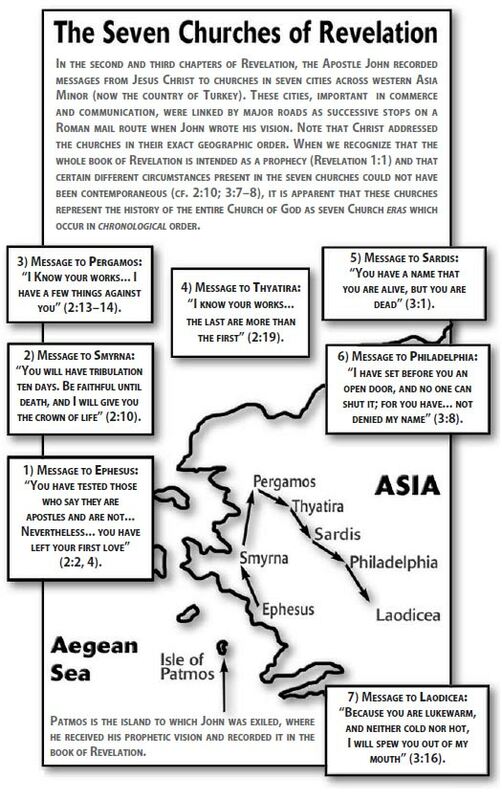 Christ’s message to this third stage of God’s Church (Paulicians) is characterized by the Church at Pergamos (Revelation 2:12–17). The wordPergamos means “fortified,” and the Church members of this era were noted for dwelling in remote, mountainous areas. In Revelation 2:13, Christ said of the Pergamos Church that they dwell where Satan’s throne is. Pergamum was a center of the ancient Babylonian mystery religion. In 133BC, Attalus III, the last “god-king” of Pergamum, died and in his will bequeathed his kingdom and his title, Pontifex Maximus(“Supreme Bridge-builder” between man and God), to the Romans. The Roman rulers took the title and held it until Emperor Gratian bestowed it on Pope Damascus in 378AD. The Catholic popes continue to use that title to this day. Also, historically, the term “Satan’s throne” alludes back to Nimrod’s ancient kingdom, which in distant antiquity included Armenia and the upper Euphrates (Genesis 10). The Pergamos Church—the Paulicians—geographically relocated to that same area after Constantine enforced Sunday keeping on the Roman Empire. As far back as the fifth century, we find the Paulicians condemned as heretics in Catholic documents. However, the first prominent leader among them with whose name we are familiar is Constantine of Mananali (ca. 620–681AD). About 654AD he began to preach, helping to revitalize the Church. Prior to his ministry, most of the Church membership consisted of descendants of Christians who had fled Greece and Asia Minor more than two centuries earlier. They preserved the names of their original congregations and continued to refer to themselves as the “church of Ephesus” or the “church of Macedonia,” even though they were located hundreds of miles from the original sites. In 681AD, Constantine of Mananali was executed by Byzantine (Eastern Roman) soldiers commanded by an officer named Simeon. Profoundly overwhelmed by Constantine’s example and teachings, this Simeon returned in 684AD—not as a Roman soldier, but as a convert. Simeon became a zealous Paulician preacher, and in turn was martyred three years later, in 687AD. In 1828, the manuscript of an ancient book titled The Key of Truth was discovered in Armenia. The book, portions of which date to 800AD, provides us with the greatest detail of the teachings of the Paulicians. Translated into English by Fred Coneybeare around 1900, we learn from it that the Paulicians shunned the use of the cross in worship and religious art, calling it a “cursed implement.” They condemned warfare, and they observed the Passover on the fourteenth day of the first month of the sacred calendar. The Paulicians rejected the Roman Catholic Church’s claim to be the “Church of God,” and they disputed papal claims of “apostolic succession.” They regarded the Trinity, purgatory and intercession of the saints as unscriptural. In the introduction to his English translation of The Key of Truth,Coneybeare provides invaluable historical background on the practices of the early Paulicians. “We also know from a notice preserved in Ananias of Shirak that the Pauliani, who were the same people at an earlier date, were Quartodecimans, and kept Easter in the primitive manner at the Jewish date. John of Otzun’s language perhaps implies that the old believers in Armenia during the seventh century were Quartodecimans, as we should expect them to be” (Coneybeare, intro., clii). Coneybeare further states, “The Sabbath was perhaps kept and there were no special Sunday observances” (p., cxiii). He goes on to say of the Paulicians that “they were probably the remnant of an old Judeo-Christian Church, which had spread up through Edessa into Siuniq and Albania” (p. clxii). At some point in their history, however, many Paulicians succumbed to a fatal error. They reasoned that they could outwardly conform with many of the practices of the Catholic Church in order to avoid persecution as long as in their heart they knew better. This road of compromise led many to have their children christened and others to attend mass. Christ prophesied of this, admonishing the Church at Pergamos about those who held to pagan, immoral doctrines (Revelation 2:14–15). The result of their compromising was that Christ allowed severe persecution to come upon them. When persecution came, some of the beleaguered Paulicians decided that the solution to their trouble lay in entering into an alliance with the Muslim Arabs who were then making serious incursions into the Byzantine Empire. Controversies among the Paulicians during these years created various splits in the group. Prior to 800AD, a leading Church personality, a man named Baanes, came to the leadership of the Paulicians in Armenia and promulgated a doctrine of military retaliation. Shortly thereafter, another minister named Sergius became prominent within the Paulicians. Because Sergius condemned warfare, disagreeing with the position taken by Baanes, he was accused of causing a schism within the group. But, in spite of difficulties, Sergius’ ministry lasted more than 30 years. After his death, however, most of his followers began to take part in warfare as well. What did these Bogomils teach? “Baptism was only to be practiced on grown men and women… images and crosses were idols” (Encyclopaedia Britannica, 11th ed., “Bogomils”). They also taught that prayer should be done at home, not in separate buildings such as churches. They taught that the congregation consisted of the “elect” and that each individual should seek to attain the perfection of Christ. Their ministry is said to have gone about healing the sick and casting out demons. In the tenth and eleventh centuries, many Bogomils spread westward and settled in Serbia. Later, large numbers took refuge in Bosnia by the end of the twelfth century. These Bogomils were “only one version of a group of related heretical sects that flourished across Asia Minor and southern Europe during the Middle Ages under a variety of names, the best-known being the Patarenes, Cathars and Albigensians” (Encyclopaedia Britannica, 15th ed., vol. 29, p. 1098). They were condemned as heretics due to their belief that “the world is governed by two principles, good and evil, and human affairs are shaped by the conflict between them; the whole visible world is given over to Satan” (Encyclopaedia Britannica, p. 1,098). From their Balkan base, the Bogomils’ influence, initially fostered by a merchant’s trading network, extended into Piedmont in Italy and also southern France. By the time the Ottoman Turks assumed power in Bosnia, the seeds of the Truth had spread to the Piedmont, Provencal and Alpine areas of Europe. In the beginning of the twelfth century, there was a revitalization of the Truth with the raising up of the next phase of the Church under the leadership of Peter de Bruys in southeastern France. This stage in church history is characterized by the Church at Thyatira in Revelation 2. The Piedmont valleys of southeastern France were described by Pope Urban II, in 1096, as being “infested with heresy.” It was from one of these valleys, the Valley Louise, that Peter de Bruys arose in 1104 and began to preach repentance. He gained many followers among the Cathars, initially, and later among the general public. The Cathars (meaning “puritans”), among whom de Bruys originally preached, were remnants of earlier Bogomil settlements. However, by this time, most had accepted a variety of new and strange doctrines and were quite divided among themselves. His preaching, and that of his successors, brought about a revitalized Church during the first half of the twelfth century in the valleys of southeastern France. De Bruys professed to restore Christianity to its original purity. At the end of a ministry of about 20 years, he was burned at the stake. In rapid succession after him, there arose two other strong ministers, Arnold and Henri. After the death of Henri in 1149, the Church languished and seemed to go into eclipse. A few years later, a wealthy merchant in Lyons, Peter Waldo, was struck down by an unusual circumstance and began preaching the Gospel in 1161. After being shocked into contemplating the real meaning of life as a result of the sudden death of a close friend, Waldo obtained a copy of the Scriptures and began studying God’s word. He was soon amazed to find that the Scriptures taught the very opposite of much of what he had learned during his Catholic upbringing. Historian Peter Allix, quoting from an old Waldensian document, The Noble Lesson,tells us: “The author upon supposal that the world was drawing to an end, exhorts his brethren to prayer, to watchfulness.… He repeats the several articles of the law, not forgetting that which respects idols” (Ecclesiastical History of Ancient Churches of Piedmont, pp. 231, 236–237). Elsewhere, Allix writes that the Waldensian leaders “declare themselves to be the apostles’ successors, to have apostolic authority, and the keys of binding and loosing. They hold the church of Rome to be the whore of Babylon” (Ecclesiastical History, p. 175). Peter Waldo made Lyons, France, the center of his preaching from 1161 until 1180. Then, because of persecution, he relocated to northern Italy. From about 1210 until his death seven years later, Waldo spent his time preaching in Bohemia and Germany. “Like St. Francis [of Assisi], Waldo adopted a life of poverty that he might be free to preach, but with this difference that the Waldenses preached the doctrine of Christ while the Franciscans preached the person of Christ”(Encyclopaedia Britannica,11th ed.). What were some of the other doctrines taught by the Waldenses? Is there evidence that the early Waldenses were Sabbath-keepers? One of the names by which they were most anciently known was that ofSabbatati! In his 1873 work, History of the Sabbath, historian J. N. Andrews quotes from an earlier work by Swiss-Calvinist historian Goldastus written about 1600. Speaking of the Waldenses, Goldastus wrote, “Insabbatati [they were called] not because they were circumcised, but because they kept the Jewish Sabbath” (Andrews, p. 410). Andrews further refers to the testimony of Archbishop Ussher (1581–1656), who acknowledged “that many understood that they [the names Sabbatati or Insabbatati] were given to them [Waldenses] because they worshipped on the Jewish Sabbath” (p. 410). Clearly even noted Protestant scholars at the end of the Middle Ages were willing to acknowledge that many Waldenses had observed the seventh-day Sabbath. “The Waldenses could say a great part of the Old and New Testaments by heart. They despise the sayings and expositions of holy men [Roman Catholic church fathers], and they only plead for the test of Scripture.… The traditions of the [Roman] church are no better than the traditions of the Pharisees, and that greater stress is laid [by Rome] on the observance of human tradition than on the keeping of the law of God. They despise the Feast of Easter, and all other Roman festivals of Christ and the saints” (A Handbook of Church History, pp. 234, 236–237). What happened to the Waldenses? “Waldenses slowly disappeared from the chief centers of population and took refuge in the retired valleys of the Alps. There, in the recesses of Piedmont… a settlement of the Waldensians was made who gave their name to these valleys of Vaudois.… At times attempts were made to suppress the sect of the Vaudois, but the nature of the country which they inhabited, their obscurity and their isolation made the difficulties of their suppression greater than the advantages to be gained from it” (Encyclopaedia Britannica, 11th ed., “Waldenses”). As total apostasy swallowed up most remnants of the Waldenses by the end of the 1500s, God preserved a faithful remnant. Individuals who were the fruit of the last seven years of Waldo’s ministry had been converted in Bohemia and Germany in the thirteenth century. In remote areas of the Carpathian Mountain area of central and eastern Europe, individuals and small groups survived. In fact, a faithful remnant has survived in isolation in those areas down to modern times (cf. Revelation 2:24–25). As the seventeenth century approached, the next era of God’s Church was ready to emerge on the stage. Remnants of German Waldensians, sometimes labeled Lollards by outsiders, had penetrated into Holland and England as early as the fourteenth and fifteenth centuries. However, it was only in the final decades of the sixteenth century that the Church could begin to emerge openly in Germany and Britain. By the end of the 1500s, congregations that the world labeled “Sabbatarian Anabaptists” had emerged from remnants of the Waldensians and were growing in Central Europe, Germany and England. They were termed Sabbatarian because they taught and observed the seventh-day Sabbath. They were called Anabaptists, meaning “re-baptizers,” because they refused to accept as Christians those who had merely been sprinkled as babies. They taught that baptism was only for adults who had come to believe the Gospel and had repented of their sins (cf. Acts 2:38).What happened to the Church that Jesus built? It endured and it survived against incredible odds! The men and women who were the spiritual ancestors of God’s people today exemplified faith and courage. Time after time through the centuries they had to relocate in order to remove themselves from either outside persecution or internal apostasy and compromise. At those times, when it seemed that the flame of God’s Truth flickered most dimly, Christ always raised up another faithful leader to rally His people and revitalize the Work of God. Among them were remarkable men such as Oswald Glaidt, Andreas Fischer and Andreas Eossi. Their area of ministry was primarily in Germany, Poland, Hungary and parts of what later became known as Czechoslovakia and Romania. These men taught obedience to the Sabbath and Holy Days as well as a rejection of infant baptism and the Trinity. God used them to strengthen the faithful remnant and to provide a witness of the Truth as the turbulent Protestant Reformation was sweeping the same area. Glaidt and Fischer met during a trip up the Danube River in 1527. They both wrote books in defense of the Sabbath. In response to those who accused him of trying to earn salvation because he taught that obedience to the Ten Commandments was necessary, Glaidt responded, “The moral law says, ‘Do not murder,’ yet nobody would argue seriously that this is no longer in effect, nor would anyone argue that simply to refrain from murder is an attempt to achieve salvation on the basis of ‘works’” (Daniel Liechty, Sabbatarianism in the Sixteenth Century, p. 31). Glaidt was executed in Vienna in 1546. Shortly prior to his death he told his accusers, “Even if you drown me, I will not deny God and His Truth. Christ died for me and I will continue to follow Him and would die for His Truth before I would give it up” (p. 35). Books and tracts on the Sabbath and other related subjects were also published in the late 1500s by Eossi, a Hungarian of noble birth. By the mid-1600s, remnants of the Church in Central Europe were being increasingly persecuted by a resurgent Catholic Church that was regaining control there after the turbulence of the Reformation. True Christians were faced with either severe persecution or emigration to an area that offered greater freedom to practice their beliefs. The remote Trans-Carpathian mountain area, which was already home to Waldensian remnants, became a sanctuary for many. In the eighteenth century, most of the few remaining German Sabbath-keepers migrated to Pennsylvania. There were also a number of people who were associated with the “Anabaptist movement,” but who accepted otherProtestant teachings of the Reformation. From those descend such modern-day groups as the Baptists, Mennonites and Amish. In the meantime, remnants of the true Church had come into England. The scene was set for the fifth stage in the history of the Church of God, characterized by the Church at Sardis. Our first clear records of Sabbath-keeping church congregations in England date from the 1580s. By the early 1600s a public debate was being waged as to whether or not the biblical Sabbath was still in effect. During this period, quite a few books were written—many of which survive—on the subject of the law of God and the Sabbath. John Traske was one of the first in England to publish a book dealing with the Sabbath. Writing around 1618, he was imprisoned for his efforts. Some credit him with raising up the Mill Yard Church in London, the oldest known Sabbath-keeping church still functioning and parent of later Sabbatarian churches in America. Though some other historians date the founding of Mill Yard to the 1580s, well before Traske’s time, he certainly pastored the church in the early seventeenth century. Traske was later arrested and put in prison. While there, he seems to have recanted his teachings in order to gain release, though his wife refused to do so; she remained faithful to the Truth and spent the remaining 15 years of her life in prison. “In his final words to the court he simply asked them to read the following scriptures: Jeremiah 26:14–15 and Psalm 116:15.… after his execution his heart was taken out and burned, the four quarters of his body fixed to the gates of the city and his head set up on a pole in Whitechapel opposite to the alley in which his meeting-house stood. Such was the horrible price that some were prepared to pay for obedience to God in seventeenth century England” (p. 176). Another remarkable leader was Francis Bampfield, a copy of whose autobiography, The Life of Shem Acher, has been preserved in the British Museum Library. From 1662 until his death in 1683, he spent most of his time either in prison or on the run from the English authorities. Even when he was detained at Dorchester Prison, people flocked there to hear him preach. It was at this time of persecution that an event of far-reaching implications happened: Stephen Mumford and his wife, members of the Church, left England for the New World and came to Rhode Island in 1664. By the early 1700s, the Church of God in England was virtually dead. Most of the ministers at that time, in addition to preaching on the Sabbath, were now pastoring churches on Sunday to make extra money. Compromise took its toll. Upon arriving in Rhode Island, the only American colony founded upon the principle of religious liberty, the Mumfords began to fellowship with Baptists in Newport. They were not quiet, however, about their belief in the Sabbath. In 1665, within the first year of the Mumfords’ arrival, Tacy Hubbard started keeping the Sabbath with them, becoming the first convert in America. Shortly afterward, her husband Samuel joined her. In 1671, the first Sabbath-keeping church in America officially began with seven members. William Hiscox was the first pastor of the church, serving from 1671 until his death in 1704. In 1708, a second church was officially organized in Westerly, Rhode Island (later renamed Hopkinton). Throughout the eighteenth century, Rhode Island, Pennsylvania and New Jersey seem to have been the main areas of Sabbath-keeping churches. During this time, German Sabbath-keepers immigrated to Pennsylvania. Peter Miller was the best-known minister of the German Sabbath-keepers in Pennsylvania and was a friend of Benjamin Franklin. The time of the American Revolution was difficult for many of God’s people. The history of that era also demonstrates how spiritually dead many of the ministers and members were. Several congregations were greatly divided on the issue of warfare and political involvement. Jacob Davis, pastor of the Shrewsbury, New Jersey, Church of God, joined the Continental Army as a chaplain. Many of the members followed his example and enlisted also. One member, Simeon Maxson, boldly objected and labeled any church members who supported carnal warfare as “children of the devil” (Richard Nickels, Six Papers on the History of the Church of God, p. 60). He was put out of the congregation because of his stand. Sabbath-keepers in the Shrewsbury area were impoverished and divided by the War. Many relocated to Pennsylvania after the Revolution and, prior to 1800, most of those moved to Salem, Virginia (later West Virginia). The area around Salem became one of the major centers of God’s people from about 1800 on into the twentieth century. The history of God’s people in this area is not, however, the story of unity and of a great work being done. It is the story of division, apostasy and spiritual lethargy on the part of the majority—much of it furthered by the influence of the prominent Davis family, which produced many of the leading ministers in the eighteenth and nineteenth centuries. The vast majority of the brethren appear to have been so spiritually dead that they blindly followed apostate ministers into Protestantism. William Davis, born in Wales in 1663, went from the Church of England to the Quakers, then became a Baptist. In 1706, he accepted the Sabbath and applied for membership in the Newport church, but was rejected because he held wrong doctrines. Finally, in 1710, he was accepted for membership and, in 1713, was authorized to preach and to baptize. Yet he believed in the Trinity, the immortality of the soul and in “going to heaven”—totally contrary to the doctrines taught by the Church at that time! For the rest of his life, Davis was variously in and out of fellowship with the Church. “Davis played a powerful role in shaping the future of Sabbatarian Baptists” (Nickels, p. 55). In 1803, a general conference was organized by eight Sabbath-keeping congregations in the Northeast in order to coordinate their evangelistic efforts and cooperate in the publication of literature. In 1805, they adopted the name “The Sabbatarian General Conference.” By 1818, the name was changed to Seventh-Day Baptist General Conference and the organization had grown to include Sabbath-keeping congregations outside the Northeast. The changes that have occurred have been marked by a steady erosion of the Truth and a move into mainstream Protestantism. In fact, the Seventh-Day Baptist churches in Rhode Island have long since ceased housing the living Church of God. They are merely old buildings, museums of where the Truth was once taught and the Work of God was once carried on. The congregations that now meet there believe in the Trinity, observe Christmas and Easter, and have even gone back and built steeples—definite pagan symbols—onto some of the old buildings. While the bulk of Sabbath-keepers were moving further and further from the Truth, there were individual members and congregations that remained faithful. We find records of the South Fork church, in West Virginia, which observed the Passover and avoided unclean meats in the early 1800s. This little group was forced to withdraw “fellowship from the General Conference and all other Seventh-Day Baptist organizations, because of doctrinal differences” (Nickels, p. 68). By the 1870s, another generation was on the scene and, eventually, most of the South Fork church accepted the Seventh-Day Baptist organization. Another group, calling itself the Church of God at Wilbur, was organized in 1859 by Elder J. W. Niles from Pennsylvania. It was still functioning in the 1930s and was called by Andrew Dugger, in his book A History of the True Religion, “the oldest true Church of God now functioning in the state of West Virginia” (p. 311). In the 1830s, a movement arose among Protestant churches in western New York that focused on the return of Jesus Christ to this earth, and on the establishment of His literal Kingdom. This message, which first began to be forcefully proclaimed by William Miller, was totally different from accepted Protestant doctrine. His teachings on prophecy attracted much interest and stirred increasing attention as his predicted 1844 date for the return of Christ drew near. After what was termed “the great disappointment,” confusion set in among these Protestant Adventists. Ridiculed by mainline Protestants, some became disillusioned and gave up religion altogether. Others continued to search the Scriptures to see where they had gone wrong. Frederick Wheeler was a Methodist minister in Washington, New Hampshire, who had accepted the Adventist message of Christ’s Second Coming, and of the literal establishment of His Kingdom. Around the beginning of 1844, he received a visitor to his congregation. One Rachel Oakes, a member of a Seventh-Day Baptist congregation in Verona, New York, had come to visit her daughter. Hearing Mr. Wheeler call upon his congregation to obey God and keep His commandments in all things, Mrs. Oakes confronted him after the service with the truth that Sabbath-keeping played a vital part in obeying God’s commandments. Taken aback, he promised to study the subject. Within weeks, he was convinced of the truth of the Sabbath, and began to proclaim it. The truth of the Sabbath spread like wildfire among disillusioned Adventists. Hundreds of others responded, as well, to the simple truth of the real Gospel and of obedience to all of God’s commandments. Into the fellowship of these zealous Sabbatarian Adventists came Roswell Cottrell, a long-time minister and Sabbath-keeper. His family had been among the earliest members of the Church of God in Rhode Island, but the Cottrell family withdrew from the fellowship of what was then being called the Seventh-Day Baptist Church over doctrine. This was the time when such changes as the Trinity and the immortality of the soul were being adopted as official Seventh-Day Baptist doctrine. About 15 years after coming into the fellowship of the Sabbatarian Adventists, he found himself once again embroiled in controversy. Elder James White, who had emerged as the main leader among the Sabbath-keeping, Adventist Churches of God, was pushing for an organizational conference and an official name, Seventh-Day Adventist Church. There were those who opposed this change as unscriptural and also opposed giving credence to the visions of Elder White’s wife, Ellen G. White. Roswell Cottrell opposed Mr. White’s organizational moves. He wrote, in the May 3, 1860, Review and Herald, “I do not believe in popery; neither do I believe in anarchy; but in Bible order, discipline, and government in the Church of God” (Nickels, p. 162). In October 1860, at a conference in Battle Creek, Michigan, the overwhelming majority of those present rejected the name “Church of God” and adopted the name Seventh-Day Adventist as a name descriptive of their beliefs. This was the name being pushed by the Whites. Mrs. White’s visions were increasingly being advanced as “new truth” for the Church. Throughout the 1860s, the split between the majority who followed the Whites and the scattered remnant who did not became more and more decisive. During the Civil War, Church of God members took a firm stand as conscientious objectors, in contrast to the Seventh-Day Adventists under the Whites’ leadership. A delegation from the Church of God met with President Abraham Lincoln in 1863, in order to establish conscientious objector status for young men in the Church. “On the 10th of June, 1860, something over 50 of us adopted a form of a church covenant, drawn up by [M. E. Cornell].… Nearly a year and a half afterward, the same messenger held up, publicly, some other volumes by the side of the Bible… and urged us to adopt their teaching also, as a rule of faith and discipline. A portion of us were unwilling to accept these new planks in the platform of our Church.…The result was, about one half of the Church decided to receive these volumes as a valid Scripture, and drew off from us, or rather repelled us from them, denouncing us as rebels.… As it regards us being rebels, we boldly assert that we are not rebels. We have not rebelled against the constitution which we adopted, for we stand firm on it yet… so the charge of rebellion reflects with shame on them, who have made it, they being the ones who have departed from their first position and have adopted a new one” (Robert Coulter, The Story of the Church of God Seventh Day, p. 16). In August 1863, the small church paper called The Hope of Israel began to be printed in Michigan. It started with fewer than 40 subscribers. In 1866, it was relocated to Marion, Iowa, and in 1888 moved again to Stanberry, Missouri. Over the years, the paper underwent several name changes, ultimately being called The Bible Advocate. One of the most prominent figures in the Church of God during this time was Jacob Brinkerhoff. He edited the paper from 1871 until 1887, and again from 1907 until 1914. In 1874, A. F. Dugger Sr. of Nebraska entered the full-time ministry of the Church of God. From the 1870s until the years just prior to World War I, Elders Brinkerhoff and Dugger contributed many of the articles that helped to clarify and solidify doctrine in the Church. Articles on prophecy, clean and unclean meats, tithing, proper observance of the Passover and what it means to be “born again” were printed. As early as 1866, articles on prophecy taught that the Jews would be restored to a homeland in Palestine. There was some truth restored and taught but, all in all, the efforts of the Church were weak and only reached small numbers of people, primarily in rural parts of the Midwest. The phase of Church history we have focused on in this chapter is best described by Christ’s message to the Church at Sardis recorded inRevelation 3:1–6. This Church was told that while it had a name that it was alive, it was really spiritually dead. “Be watchful, and strengthen the things which remain, that are ready to die” (Revelation 3:2). While this Church as a whole is spiritually lethargic or even dead, there are a few among them who Christ says “have not defiled their garments; and they shall walk with Me in white, for they are worthy” (v. 4). The twentieth century was clearly the time of the most rapid change in human history. The century opened with the horse and buggy as the primary means of transportation, yet within the first 70 years men had traveled to the moon and back! This century saw two great world wars and the introduction of weapons of mass destruction. For the first time in human history, it was possible to annihilate all life from this planet, just as Jesus Christ foretold (Matthew 24:22). Another prophecy that uniquely characterizes this end time is that the true Gospel of the Kingdom of God will be preached in all the world for a witness and then the end will come (v. 14). At the beginning of the twentieth century, the Church of God was small and scattered, with fewer than 1,000 members, living mostly in the American Midwest. The General Conference of the Church of God legally incorporated in 1900 in the state of Missouri. The Church’s newspaper underwent a name change that same year to become The Bible Advocate. In 1903, Gilbert Cranmer, a minister since the 1850s and one of the chief builders of the Church in the aftermath of the Seventh-Day Adventist/Church of God split in the 1860s, died at age 89. In 1910, Alexander Dugger, who had served as a leader of the General Conference since its inception, as well as having served as editor of TheBible Advocate, also died. A third faithful pioneer, Jacob Brinkerhoff, died in 1916. He had served as editor of the Advocate on and off from 1871 to 1914. Mr. Brinkerhoff was considered by many to be the most outstanding leader of the Church in his time. “Jacob Brinkerhoff had served the Church of God for over 40 years.… Instead of buying a home in 1874, Brinkerhoff used the money instead to buy the press equipment for the Advent and Sabbath Advocate.… Single-handedly, it seems, he had prevented the total collapse of the Work” (Richard Nickels, History of the Seventh Day Church of God, p. 85). Andrew N. Dugger, son of Alexander Dugger, began his ministry with the Church of God in 1906. When Jacob Brinkerhoff retired from the editorship of The Bible Advocate in 1914, he became both president of the General Conference and editor. “During his tenure as president and editor, Dugger exerted much influence upon the Church. Throughout the early period of Dugger’s leadership, the Church of God experienced some of its most rapid and greatest growth” (Coulter, pp. 41–42). Andrew Dugger retained leadership from June 1914 until 1932. The issue of organization and government had long been a source of controversy within the Church of God. Recognizing that no Work of any consequence could be done with the meager amount of monies coming into the headquarters in Stanberry, Missouri (less than $1,000 in 1917), Andrew Dugger took steps to correct the situation. He sent a survey to the membership in 1922 to find out how much tithe they had paid in the previous year, and to whom it was paid. It became apparent that most of the tithes were being collected by individual ministers, and that one particular minister who “worked little” had collected the lion’s share. Soon, a policy was enacted that all tithes were to be paid into the State Conferences, and that a tithe of that tithe was to be sent to the General Conference. In 1923, the income of the General Conference in Stanberry jumped to more than $18,000. In about 1904, G. G. Rupert entered the ministry of the Church of God. Mr. Rupert had previously been in the ministry of the Seventh-Day Adventist Church and had raised up congregations in South America. After several years of growing doctrinal disagreement, he left the Adventists in 1902. Among other things, Mr. Rupert had come to understand that both the Sabbath and the annual Holy Days were binding upon the New Testament Church. In 1913, Jacob Brinkerhoff published a series of articles by G. G. Rupert in The Bible Advocatediscussing the subject of the law of God, arguing that the Holy Days of Leviticus 23 were binding upon the New Testament Church. Though the Church in the United States paid little heed to this teaching, many of the South American congregations Mr. Rupert had established not only followed his example in leaving the fellowship of the Adventists, but also accepted God’s Holy Days. Because of disagreement between Mr. Dugger and Mr. Rupert over some issues of doctrine, and particularly over the issue of church organization and government, Mr. Rupert continued as an “independent” Church of God minister, publishing his own magazine, The Remnant of Israel, until his death in 1922. The late 1920s and early 1930s saw the Church of God become virtually paralyzed by political infighting and doctrinal strife. The Church’s Conference in 1929 was marked by considerable confusion and dissension. Issues of controversy revolved around “born again,” clean and unclean meats, the use of tobacco, the date of the Passover (Nisan 14 or 15), and the work of the Holy Spirit (Pentecostalism). The number of conversions dwindled and the Work of the Church was virtually at a standstill. It was at this point, in the autumn of 1926, that the life of Mr. Herbert W. Armstrong became intertwined with the story of the Church of God. Mr. Armstrong’s ministry undoubtedly had greater impact on more people than any Church of God minister since the first century. Challenged by his wife regarding which day was the Christian Sabbath, as well as by a sister-in-law over the question of evolution, Mr. Armstrong began a six-month period of intensive study. By the spring of 1927, he had come to understand that much of what he had grown up believing was not biblical Truth. He learned that both the seventh-day Sabbath as well as God’s annual Holy Days are to be kept by Christians today! In the aftermath of this intensive study, Mr. Armstrong struggled with the question: “Where is the true Church?” He eventually entered the fellowship of Church of God brethren in the Willamette Valley of Oregon, because he saw them as retaining more Truth than any other group. By 1928, Mr. Armstrong began submitting articles for publication in TheBible Advocate. As there was no minister in Oregon at that time, the brethren in Eugene frequently asked him to speak to the congregation. In June 1931, Mr. Armstrong was ordained to the ministry by the Oregon Conference of the Church of God, thus beginning a ministry that lasted almost 55 years! In the meantime, trouble was building for the Church of God as a whole. At the General Conference, held in August 1933, Andrew Dugger, the primary church leader for the past 20 years, lost his position by one vote. This precipitated a crisis that split the group down the middle. “On the one side, Andrew N. Dugger and others held to ‘reorganization’ of church government, clean meats, no tobacco, and Passover on Nisan 14. On the other hand, Burt F. Marrs led a group of ‘independents’ who were pro-pork and tobacco, and felt Passover should be on Nisan 15. The issue of when to observe the Passover was debated for three days during the time of the division” (Nickels, p. 151). Andrew Dugger withdrew from the General Conference of the Church of God headquartered at Stanberry and held a meeting to reorganize the Church in Salem, West Virginia, in November 1933. A new organizational structure was instituted with “Twelve Apostles,” “Seventy Elders” and “Seven” set over the finances. Offices were chosen by lot rather than by vote. Mr. Armstrong, of Oregon, was chosen as one of “The Seventy.” He and most of the Oregon brethren switched their affiliation from the Stanberry organization to the new organization headquartered in Salem. Though Mr. Armstrong did not receive a salary from Salem, he accepted their ministerial credentials and submitted monthly ministerial reports. “The division of the Church of God (Seventh Day) caused the membership and leadership much grief. Many members and prospects were discouraged by the frequent attacks one church launched on the other. In some instances, ministers switched organizations, bewildering their membership. In other cases, the membership became pawns in the struggle between ministers who were vying for their loyalty and support. The membership growth of the 1920s was not realized or even approached in the decades of the 1930s and 1940s” (Coulter, p. 55). Actually, membership decreased during this period. At the time all this was occurring, the foundation was being laid for a Work of God that would have unprecedented worldwide impact. Rather than waste his energies on political infighting within the Church, Mr. Armstrong began making a regular weekly radio broadcast aimed at preaching the Gospel to the world. The program, called Radio Church of God, first aired on KORE, a 100-watt station in Eugene, on the first Sunday in January 1934. In February of that year, Mr. Armstrong began publication of a mimeographed “magazine” called The Plain Truth, which was at first sent to about 200 people. Little did he realize at the time that Christ was using him to raise up the sixth era of the Church, typified by the Church at Philadelphia (Revelation 3:7–13). In addition to the weekly radio broadcast, Mr. Armstrong conducted evangelistic campaigns throughout the area. Though several churches were raised up as a result of his efforts, these new congregations usually fell apart or went astray because of a lack of faithful, dedicated ministers to shepherd the flock. During this period, Mr. Armstrong came into increasing conflict with the Church headquarters in Salem because of his teachings about the identity of Israel and the annual Sabbath days. Although Andrew Dugger had admitted in a private letter that Mr. Armstrong’s teachings on the “lost Ten Tribes” were correct, Mr. Dugger refused to publish an article on the subject in The Bible Advocate. Finally, the issue of the Holy Days came to a head in 1937. The following is quoted from the minutes of the business meeting held in Detroit, Michigan, May 5–10, 1937, by the Board of Twelve Apostles of the Church of God (Seventh Day), Salem, West Virginia, Headquarters: “May 7, at 1:00 p.m. Reading of Elder Armstrong’s letter to the Twelve. Reading in periods of 20 minutes each of Elder Armstrong’s articles on the Feast of Unleavened Bread, the Passover, Pentecost, Feast of Tabernacles, etc., followed each time by discussion pro and con by the Elders.… A decision was made as given in the following resolution: ‘Inasmuch as some have troubled the Churches, teaching them they should observe the Feast of Unleavened Bread and yearly Sabbaths… we reaffirm the teachings of the Church of God on this point… that we observe no such custom’” (John Kiesz, History of the Church of God, p. 180). According to the official records provided by Virginia Royer, bookkeeper of the Church of God Publishing House in Salem, “It was in 1938 that he [Mr. Armstrong] was asked to turn in his credentials for continuing to preach contrary to Church doctrine” (p. 180). Although Mr. Armstrong no longer carried ministerial credentials from the Church of God (Seventh Day) after 1938, he continued to teach and preach more forcefully than ever. As reported in the April 1939 Good News, the weekly Radio Church of God broadcast was reaching 100,000 listeners in the Pacific Northwest. That also was the year that the first, full eight-day Feast of Tabernacles was held in Eugene, attended by 42 people. (From 1933 to 1938, services had been held only on the Holy Days.) In addition to Mr. Armstrong, other Church of God elders such as John Kiesz were guest speakers at the Feast until about 1945. By mid-1942, the name of the radio program changed from Radio Church of God to The World Tomorrow, and there was an experimental period of daily broadcasts begun in the Los Angeles area. In the late summer of 1942, more than 1,700 people attended an evangelistic campaign Mr. Armstrong held at the Biltmore Theater in Los Angeles. The Work that God was accomplishing through Mr. Armstrong was growing and bearing fruit. In August 1942, The World Tomorrow went nationwide, with a Sunday broadcast from WHO in Des Moines and, in 1943, WOAI in San Antonio was added. By 1944, The Plain Truth’s circulation reached 35,000. As the impact of the Work God was doing through Mr. Armstrong grew, the Church of God (Seventh Day) continued to split and splinter with more and more independent churches and ministers. There were efforts toward unity that resulted in the merger of the Salem and the Stanberry groups in 1949. However, that merger itself spawned additional splits. Twenty years later, in 1969, that Church’s primary publication, The Bible Advocate, had a circulation of just over 2,000. The Church of God (Seventh Day) represented the final phase of what is described in Revelation 3 as the Church at Sardis—a Church described as spiritually dead, though there would be a few of its members who walked with Christ in white. In 1946, God started positioning the Radio Church of God, and the Work being done through Mr. Armstrong, for dramatic growth. Faced with the pressures of daily radio broadcasting (for which Hollywood was well-equipped to provide technical support), and recognizing the need for a college to train an educated and faithful ministry, Mr. Armstrong looked into moving to Southern California. He located an appropriate property in Pasadena, and entered into negotiations to purchase it. At this time, Mr. and Mrs. Armstrong took a trip to Europe to investigate the possibility of establishing a European branch of the college to prepare ministers for a worldwide Work. No one can accuse Mr. Armstrong of thinking small! Yet most people would have viewed his idea as totally unrealistic. After all, only 50 people attended the Feast of Tabernacles in Belknap Springs in 1946! There was not even an American college up and running—only great dreams and a run-down estate with two buildings that Mr. Armstrong was trying to purchase. Others, both within and without the Church of God, were talking about “when this thing folds up.” However, vision and the ability to “think big” were qualities Mr. Armstrong demonstrated in far greater measure than any other Church of God leader of his day. Ambassador College opened its doors in the fall of 1947, with four students and eight instructors. Expansion, and a European branch college, would have to wait—for a little while. In 1949, Ambassador College students conducted their first nationwide baptismal tour. Much of the fruit of those early, student-led baptismal tours was reflected in the jump in Feast attendance from 150 in 1951 to 450 in 1952. In December 1952, Mr. Armstrong ordained the first evangelists of this phase of the Church of God: Richard Armstrong, Raymond Cole, Herman Hoeh, C. Paul Meredith and Roderick C. Meredith. In February 1953, Marion and Raymond McNair were ordained, bringing the total to seven. This began a period of rapid growth and development in the Work. After the first two classes of Ambassador College students had graduated, a Graduate School of Theology was established. Mr. Armstrong used the Graduate School of Theology as a springboard to delve more deeply into a number of subjects, the most important of which involved the nature of God and the destiny of man. Throughout its history, the Church of God has been non-Trinitarian, never accepting the formulations of the early Catholic councils as a valid guide for Christians. However, in modern times, it was not until the spring of 1953 that Mr. Armstrong and the other ministers began to develop a clear understanding of the biblical teaching that God is a divine Family into which converted human beings will be born at the resurrection. At first, they attempted to prove this understanding false, from the Bible. Instead, they found this vital truth reaffirmed throughout God’s Word. Though this understanding was the clear implication of much that had previously been taught, Mr. Armstrong and the others found it challenging to accept this simple—yet profoundly important and overwhelming—truth. This key teaching of Scripture—that we can be born into the Family of God—is perhaps the single greatest truth that God restored, through Mr. Armstrong, to the Church of God. Two giant leaps forward in the preaching of the Gospel occurred in 1953. The year began with the opening of one of the greatest single doors in the history of the Work. On January 1, Radio Luxembourg—at that time the most powerful radio station on earth—began broadcasting The World Tomorrow to Europe. Additionally, Mr. Armstrong obtained time for a daily broadcast carried over the entire ABC Radio Network. In February 1953, Richard Armstrong (Mr. Armstrong’s eldest son, who died in an automobile accident in 1958) opened a mailing office in London. In 1954, accompanied by his wife Loma, Richard Armstrong and Roderick C. Meredith, Mr. Armstrong conducted evangelistic campaigns in Britain. In 1956–57, Mr. Meredith returned for more campaigns. In 1958, back again in the United States, he was appointed second vice president of the Church. In May of 1959, Mr. Armstrong announced that Mr. Meredith would lead another series of campaigns in Britain. Here is what he wrote to British co-workers: “Mr. Meredith is fully consecrated, utterly sincere.… He is going to tell you things you can’t hear from any other source.… You’ll be shocked, surprised—you’ll hear more real truth in one night of these meetings than most people learn in years of the preaching of our day!” (May 19, 1959). By October 1960, the second Ambassador College opened its doors in Bricket Wood, England. In 1964, a third campus opened in Big Sandy, Texas. Throughout the soaring 1960s, Garner Ted Armstrong (Mr. Armstrong’s younger son) served as the main speaker on The World Tomorrow and as vice president of the Church. Dr. Roderick C. Meredith (who had in January 1966 received his Th.D. from the Ambassador College Graduate School of Theology) was named director of the U.S. ministry. In 1967, Mrs. Loma Armstrong died at age 75. By the end of the 1960s, signs of future problems for the Work were already surfacing. In January 1972, the Church was shaken by the removal of Garner Ted Armstrong from his responsibilities. Four months later he was reinstated. The 1970s saw in the Church, as in America as a whole, the emergence of an increasingly liberal, permissive spirit. A number of ministers and members left the Church in 1974; increasing doctrinal confusion, coupled with accusations of scandal, assaulted the Work. After beginning recovery from massive heart failure in 1977, Mr. Armstrong finally removed his son from his responsibilities in the spring of 1978 and disfellowshipped him in June. In January 1979, the Church was temporarily hit by a receivership imposed by the State of California. Mr. Armstrong, from Tucson, Arizona (where he was still recovering from heart trouble), named Dr. Meredith to his old job as director of the ministry, seeking to restore stability to the Church and the ministry during this troubled time. At the same time, Mr. Armstrong sought to “set the Church back on track” doctrinally after the liberal, watered-down doctrinal approach of the 1970s. By the time of his death in January 1986, The Plain Truth had a circulation of more than eight million copies printed in seven languages. Attendance at the Feast of Tabernacles approached 150,000 worldwide. When Joseph Tkach took the helm of the Worldwide Church of God upon the death of Mr. Armstrong in January 1986, the Church was a seemingly unified body. It appeared focused on the Work of God that lay ahead and committed to the Truth. There were problems beneath the surface, however. They became increasingly obvious, at first faintly and then more clearly. In Revelation 3, we read of the two final phases of the history of the Church of God. The Church of Philadelphia is characterized by zeal to do the Work. God promised to set before them an “open door” to preach the Gospel (v. 8) as well as to protect them from the future Great Tribulation (v. 10). However, there is a final, seventh stage of the Church described, the Church at Laodicea. This Church is characterized by spiritual lukewarmness and lethargy (vv. 15–17). It became increasingly apparent, from the very early 1970s onward, that two different “spirits” co-existed within one organization—though Mr. Armstrong put the Church “back on track” during the last seven years of his life. Starting about a year after Mr. Armstrong’s death, there began a gradual trend back toward the permissive, liberal approach of the 1970s. Within a few years, however, changes moved far beyond those of the 1970s, into total apostasy from the Truth—even to the point of teaching the Trinity and that obedience to God’s law (including the Sabbath, Holy Days, tithing and unclean meats) is unnecessary. In December 1992, 40 years after his ordination, Dr. Meredith was forced out of the Worldwide Church of God because of his refusal to compromise with the prevailing forces of apostasy. Joined by faithful brethren and ministers, Dr. Meredith moved quickly to revive the Work of God under the banner of the “Global Church of God.” Within six weeks, the Church began producing a weekly radio program. In May 1995, the Church began a weekly telecast. In January 1995, the Worldwide Church of God leadership dropped all pretense of continuity with historic Church of God doctrine and openly embraced Protestant theology. This brought about a virtual “meltdown” of the organization, and led to the departure of thousands of brethren as well as scores of ministers from around the world. Sadly, this post-1995 departure spawned many competing organizations, and to the formation of a multitude of independent ministries that have continued to split and divide. In November 1998, several Global Church of God (GCG) board members attempted to stage a “corporate takeover” of that organization by ousting Dr. Meredith against the wishes of a majority of the Church’s Council of Elders. However, most Church members and ministers continued to recognize Dr. Meredith and his Council of Elders as the human leadership of the Church under Jesus Christ. Immediately after his ouster from the GCG, Dr. Meredith revived the Work under the banner of the “Living Church of God,” supported by thousands of faithful brethren and ministers, and was back on television in less than two months—on the very same television station and in the very same time-slot that the GCG board members canceled! Forty weeks after Dr. Meredith announced the formation of the “Living Church of God,” the GCG entered into bankruptcy proceedings. Since then, the splinter groups forming from the bankrupt organization have continued to scatter and divide. The ten men who sat on the reconstituted GCG Council of Elders in December 1998 after the ouster of Dr. Meredith scattered within a few years into at least seven different Church of God organizations. Some of those organizations still exist; others collapsed within a few years of their founding. Still others suffered further divisions and splits that have greatly diminished their effectiveness in reaching the world with the true Gospel message. The Living Church of God has maintained its focus on doing the Work—reaching the world with the true Gospel message of Jesus Christ. You are reading this booklet because of the spirit of teamwork and unity that has allowed the Living Church of God to hold Philadelphian zeal as its common ideal, and to reject the spirit of self-will and “resting on one’s laurels” that has afflicted so many Laodicean members of God’s Church. The Living Church of God is committed to living by every word of God—including Jesus Christ’s “Great Commission” to go “into all the world and preach the gospel to every creature” (Mark 16:15). Dr. Meredith has done his best to ensure that the Work will continue powerfully even if he must die before Christ’s return. He has appointed Mr. Richard Ames—ordained into the ministry in 1965, and ordained an evangelist by Mr. Herbert W. Armstrong during the Days of Unleavened Bread in 1984—to succeed him if necessary as the human leader of the Living Church of God, to carry on accomplishing the Work that God has given His Church to do. Mr. Ames was one of four presenters who helmed the Worldwide Church of God’s World Tomorrow telecast after Mr. Armstrong’s death, and he has spent the last half-century as a pastor, teacher and broadcaster, declaring the true Gospel to a world that desperately needs Christ’s return. All around us, we can see how Satan has sown confusion and discouragement. Many brethren are hurt and angry, or have been overwhelmed by the cares of this life. Others have been deceived by false teachers, and have gone into apostasy. Still others have become so lethargic and lukewarm that they have lost their vision and merely wish to maintain local congregations, no longer caring about doing the Work. This represents a fulfillment of Christ’s Matthew 24:10–13 warning to the Church. Where is the Church that Jesus built? It has not died out! Rather, it has defied the gates of hell and is miraculously defying them still. Today, the Living Church of God continues to do the Work of God, proclaiming the true Gospel to a world spiraling toward destruction. Thanks to the faithful and dedicated leadership of Dr. Meredith, millions have received through the Living Church of God a warning message about God’s end-time intervention in world affairs. Will you be one whom God uses to finish His end-time Work? Do you have the true Philadelphian spirit that reaches out to the whole world in genuine love and concern to share God’s message of Truth and hope? Do you consider it important that the House of Israel be warned of the impending time of Jacob’s trouble? Is the Work of God more important to you than your own personal comfort? We in the Living Church of God understand that we are a continuation of the Philadelphia era that Christ raised up through Mr. Herbert W. Armstrong many years ago. We are motivated by a sense of urgency in these years that are the immediate prelude to the Great Tribulation. We truly believe what Jesus Christ taught—that we must work the works of the Father while it is yet day, for the night indeed comes when no man can work (cf. John 9:4)! Will you, too, heed Christ’s words?